The HIV/AIDS epidemic plays a significant role in the lives of all people in Kenya. Most people know someone who is infected and living with HIV or who has died directly or indirectly from the disease. The ability to map the locations of each of the more than 7,000 clinics across all 47 counties of Kenya provides immediate visualization of the status of prevention and treatment services, supply chain and inventory levels of critical antiretroviral therapy (ARVs) medicines and beyond. The United Nations Programme on HIV/AIDS (UNAIDS) needed a seamless digital business platform in the HIV Situation Room in Kenya. There are dozens of datasets around the HIV/AIDS epidemic that provide only a singular view. The challenge is that it takes a significant multi-stakeholder coordinated response to monitor and increase service delivery operations at a community level, with the ultimate goal of eradicating AIDS by 2030 and creating a global AIDS-free generation. Because of this multi-stakeholder scenario, datasets and their data sources are independently owned and maintained. For example, critical funding and budget data for all aspects of prevention, treatment, drugs, community programs and other purposes are maintained by a different organization than the clinical response data such as number of people on treatment and in care, number of pregnant women attending antenatal care clinics and other allied data. 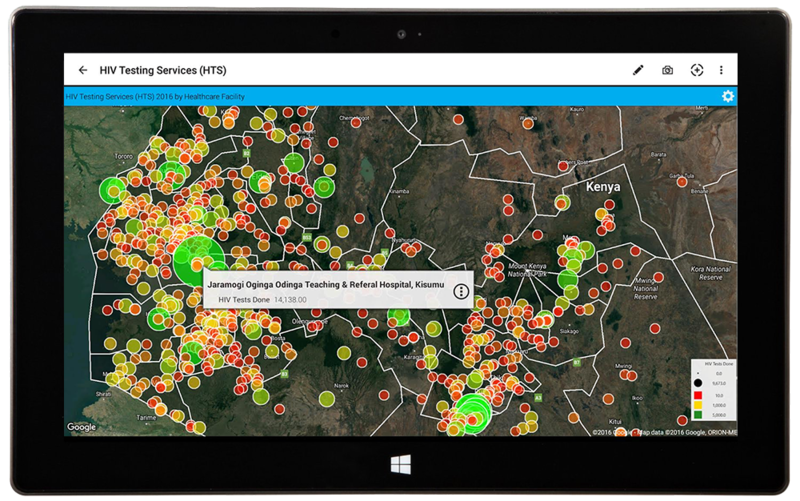 Screenshot of Situation Room solution illustrating density of HIV testing services for all counties in Kenya. In this siloed situation, there was never a complete picture of the HIV/AIDS epidemic, which created challenges in scaling community-targeted responses. It is important to “think global, but act local” because the HIV/AIDS scenario can vary county by county. For example, one county may need to focus on caring for pregnant women whereas a neighboring county may need specific programming in place to address high-risk populations such as drug users or adolescents. Given the number of data sets, a reliable and extensible tool to accurately map and visualize their data was needed. The team decided to use the Google Maps API because of their familiarity with it, its numerous services and most importantly, its reliability. Google’s Static Maps API plots geographically related information in a manner that allows UNAIDS to easily make decisions and quickly identify location-based trends within their complex data sets. Using Google Maps’ Android APIs, they could easily display custom drawings (shapefiles), providing geographical border boundaries for subnational areas such as counties, provinces and facilities. The combination of plotting geocoordinates of every health care clinic in Kenya along with the geographical boundary granularity offered by Google Maps allowed the team to leverage diverse datasets, overlay them on the Google Map, and gain new insights into how the HIV/AIDS epidemic is progressing and where gaps exist. Screenshot of the Situation Room solution illustrating drug stockout risk by facility for three high-burdened counties in Kenya. Tremendous layers of support from many organizations in the public and private sector are the secret to the success of the HIV Situation Room. The roles of UNAIDS, the Kenyan Government, the National Aids Council, the Kenya Medical Supply Authority and others have provided the political and financial support to make the project successful. The platform powering the overall solution is the iVEDiX analytics platform; a significant component of the solution is data visualization thanks to the Google Maps APIs. iVEDiX’s relationship with Onix allowed them to share the vision of the HIV Situation Room solution and identify the right Google Maps components to meet the business requirements. 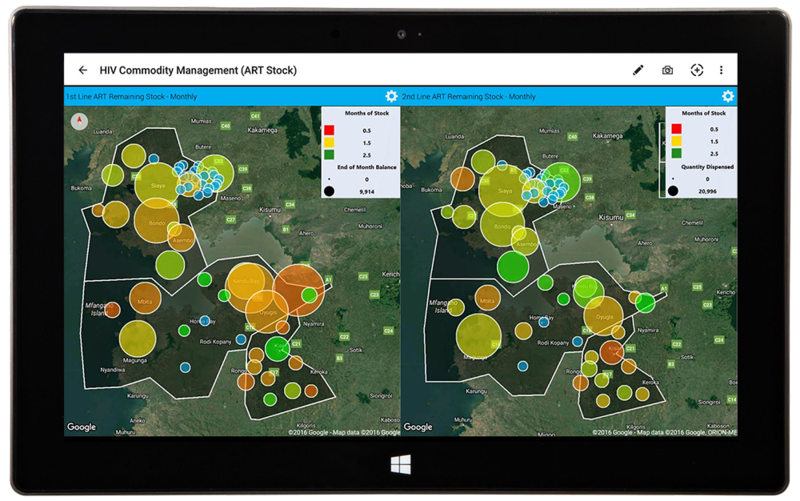 As an expert in the geospatial field, iVEDiX was able to work easily with Onix to identify the right solution mix and procure the licensing that is now benefiting users around the world in the UNAIDS organization — and throughout Kenya.